Jane Feldmesser, Ahavah member, pies Ben Steigman, Regional Moreh, at WRC 2013: Spirit Convention. The AZA Board was pied as a result of having less money in their jar at the conclusion of the Penny War. However, the board conducted themselves as gentlemen throughout the process and were very kind to those who pied them. Stand Up! is our initiative to empower teens to engage in social entrepreneurship and change the communities around them. Wisconsin Region #64 has decided to Stand Up! For The Kids. For the fall term, we had a penny war to support Voice of the Children, a charity run by seventh-graders at the Milwaukee Jewish Day School. 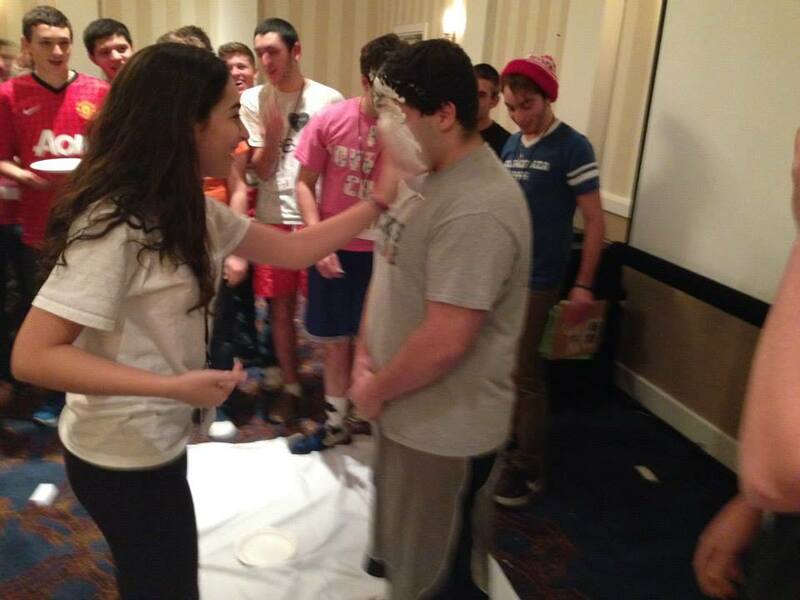 We raised over $300 in helping them, but the consequence was pie in the face for the AZA R-Board. As shown by Ben Steigman's experience,(above left) it turned out all right. Some chapters have consistent Stand UP causes, while others float around between topics. Either way, Stand UP is an excellent way to change our perspectives and our community!